The lofty and rolling battlements made of thin red bricks, ten on each side of the fort are visible from miles around. The circumference wall is about 40 meters high. There are two old vintage guns mounted on pedestals in the dusty courtyard of the Fort. On the western side are small under ground cells now infested with bats and wood being eaten by termite. As per the fable the secret to change metal into gold was told to Prince Deoraj by his guru Yogi and there still is a treasure hidden somewhere in the Fort. (This idea keeps coming to me again and again: what if I can find the hidden treasure?) Nawab Bahawal Khan constructed a mosque with cupolas and domes of exquisite marble in 1849. It is a replica of Moti Mosque, Delhi. As per the legend there are some graves near the fort, which are said to be of the companions of the Prophet Muhammad (PBUH) and the other Muslim reformers who rendered great services to spread the light of divine Islam in the area. A few hundred yards from the Fort in a hall with engraved doors in witch Abbasi Amirs and their families are buried: Nawab Muhammad Bahawal Khan (2nd), Nawab Sadiq Muhammad Khan (2nd), Nawab Muhammad Bahawal Khan (3rd), Nawab Fateh Muhammad Khan, Nawab Muhammad Bahawal Khan (4th), Nawab Sadiq Muhammad Khan (4th), Nawab Muhammad Bahawal khan (5th), and Nawab Sadiq Muhammad Khan (5th), Sahibzada Abdullah son of Nawab Sadiq Muhammad Khan (5th), Rahim Yar Khan son of Nawab Sadiq Muhammad Khan (4th) are prominent among those buried there. There are graves of the ladies of the Abbasi family in the north-western corner. Apart from business, people travel for so many different reasons: to explore, to feel, to learn, to get away from humdrum of the fast lane life, and to lose themselves or find themselves. Lately, concept of family travel for holidays is also getting very popular. Families go to different places and enjoy in new and different settings. In this information era, the Internet has brought seismic changes in the ways people make travel plans. Planning holiday trips and buying cheap tickets online is on the rise in more connected countries of the world. People want to buy cheapest tickets and it is generating a plenty of competitive spark between service providers like airlines. Sometime it becomes difficult to choose the best. That is where FlightSprite.com comes in. An independent service, FlightSprite.com provides cheap flights booking on a few selected airlines such as Qantas, United, Jetblue, Emirates and Air Canada. Welcome to FlightSprite.com specialises in cheap air travel and literally offers cheapest tickets available for any flight that you would want to book with them. They offer tickets 20% cheaper than what you would buy at your local travel agent OR the flight itself. Amzing. Have a look at FlightSprite.com and see what they are offering and how they can help you find cheap Qantas anywhere. Try them and enjoy your next trip. Through the night the gusting wind kept at it. At sometime after five the sun broke through the shackling layers of gray haze and appeared as a pale yellow disc levitating just above the horizon. It was time to take the short walk to the crest of the ridge of Bail Pathar. I am no mountaineer and though I’ve been in some high places, I have never actually climbed a real peak. But one thing I know: even insignificant peaks, simply by their very nature of being peaks and therefore higher than the surrounding ground, offer something more than just great views. It was here where long before the dawn of history primitive man placed his gods. Peaks were sacred. Whether it be the puny Miranjani near Nathiagali; or the 4800 metre Deo nau Thuk (Peak of the Jinn) on Deosai; or Musa ka Musallah in Kaghan; or Ilam in Swat; or Kutte ji Qabar (The Dog’s Grave) in the Khirthar Mountains; or Takht e Suleman, they, one and all, were revered places. Those were places for man to approach in worshipful and reverent state of mind, perhaps with an offering or two for whatever gods man believed in. These gods were created not as man regarded the peak from the base. They were created only after our ancestors were driven up by that curiosity that made them human as distinct from the other primates. Upon the mountain, at the apex of human endurance, the excitement of the panorama those primitive eyes beheld was paled by the heightened consciousness of man’s own place in the great scheme of things. This realisation then as now is not of grandeur and supremacy, but of inconsequence and paltriness – man’s real station in the grand scheme of things. This is the light that removes the last swagger from lowly humans. On some hilltops (Tilla Jogian near Jhelum, for example) this awareness is higher than on others. And so it was that high places the world over became the seats of gods. Immediately below us to the east right where our camp was spread out was Sahib Talab – the Sahib’s Pond, glinting in the dull light of the hazy morning. Far beyond that was a blue-gray ridge and then the plains. On clear nights the lights of Dera Ghazi Khan and Taunsa, and on clear days the silver ribbon of the Sidhu River could be seen, we were told. To the west a wide valley, scoured by four dry streams, spread at the foot of our mountain. Beyond, rose a khaki ridge and on its other side Balochistan was spread out all but unseen in the dust haze. To the north were more hills and to the south a round knoll, the highest part of the Bail Pathar ridge, blocked further view. Risaldar Yaqoob Shah of the huge pot-belly, the trencherman of this journey, had earlier told us the story of the bull and the boulder: once upon a time a Baloch came up this mountain with his bull. Tying the animal to a boulder, he went about some business and when he returned he found the animal dead. Since that day the boulder was considered possessed and if anyone tied their animals to it the animals died. End of story. As stories go this one was the most banal and unimaginative, even rather stupid. Neither is a boulder called pathar in Balochi, nor a bull a bal. Furthermore the first part of the name is clearly pronounced ‘Bail’ and not ‘Bal,’ consequently the story could not be true. The origin of the name is lost in the mist of time and in the tradition of all self-styled thinkers who invent heroes (sometimes events) to match place names (Kamalia and Qabula are two pertinent examples in Punjab), some moron thought up this yarn. I hotly debated the point until Yaqoob Shah lamely said since ‘bail’ in Urdu was an ivy or creeper, it might be that there was a stone on this hill that was carved with such a form. The poor man got no respite and this notion was shot to pieces very quickly. How could it be, it was asked, that a whole mountain was named after some rock or the other and no one even knew where the rock was? But back on the top of the ridge Rehmat Khan had arranged tea for us. We sat in the blustering wind and drank the sweet brew as he told us of the angrez woman. It was about thirty years ago that a white woman was found wandering about near a village at the eastern foot of the mountain. The man who first found her, being a true Baloch, asked her to wait in an otaq (guest room) and went off to fetch someone who could understand her language. When he returned the woman was gone. Disappeared. Therefore, it was swiftly deduced, she was a spy. Moreover, the woman had shown the man a map with the Bail Pathar school marked on it. The school with its roster of one teacher and ten pupils on a map! That was sufficient for anyone who doubted her being a spy to now be fully convinced. One wonder, though, what some crazy white woman should be spying for in the parched wastes of west Punjab hill country. But more than that one wonders what the building that everybody thought was a school was actually being used for to have been so prominently marked on the spy’s map. Now that was something either straight out of an unlettered man’s mind or very, very mysterious indeed and worthy of the files of our intellgence agencies. The story of Sahib Talab, on the other hand, was cannier. Howard, a Deputy Commissioner of the early 1940s, once visited this mountain. He found it dry and barren, perhaps because of a drought, and local shepherds greatly distressed. The good man ordered the pond to be excavated that has ever since been called the Sahib’s Pond. In the worst years of the drought that now seems to be coming to an end, the pond had run dry only a couple of times. But the nearly continual rains since December have filled it up besides generally greening the region. We returned to camp in time for breakfast. Over the meal we discovered that Rehmat Khan was not permitting departure without lunch. That would mean travelling during the hottest part of the day and, worse, another roast lamb. But no amount of pleading worked. We resigned, asked him to have the blue and orange canopy put up again and sat back under its shade. The Inspection Book was produced and Raheal showed me a past entry. Dated the last day of June 2001, it recorded Raheal’s first visit to Bail Pathar in the capacity of Political Agent. He is a strange person, this Raheal. I know for a fact that as Political Agent he was the first one since 1947 to visit some places in his jurisdiction in the tribal outback of Dera Ghazi Khan. Having travelled with him before I have seen Inspection Books inscribed by officers of the Raj in 1947 and then by Raheal. In the intervening half a century no Pakistani official had deemed it fit to visit those areas! The point of interest in the notation from June 2001 was that having enjoyed his trip to Bail Pathar, Raheal had ended his note saying he would like to return to the mountain with me. His wish, he said, had come true. The visit back then was work for Raheal had cases to dispose of. This time around it was just something we had to do together. Meanwhile, word had got around that Raheal was visiting the mountain and soon a delegation of liberally turbaned Baloch elders arrived with their entourages. These latter were perambulatory arsenals and could have started a small war on Bail Pathar. Solemnly the elders sat cross-legged and presented their petitions to the sahib. Having come with supplies Raheal, a trained medical doctor, had turned his earlier visit into a medical camp. Scores of women turned up to be treated for night-blindness He had distributed the necessary vitamins and we now learned that nearly all his patients were cured. As a result women unable to attend that first camp were asking for treatment and Raheal promised to return with medical supplies. Men travel to cities and get their requirement of a varied diet. But women, the lower order of humanity in a tribal setting, eating only the leavings of their men, unacquainted with fruit and vegetables in a harsh land that produces nothing but some cereal, are seriously malnourished. Raheal had only discovered the tip of the iceberg. The sloth-afflicted officials of the Department of Health unwilling to undertake such hard journey find it easier filling in registers in the comfort of their offices while the poor and the unknown of Jinnah’s Pakistan living on the edge of the Middle Ages continue to suffer in silence. Midmorning was lunch time on Bail Pathar and I hoped I was seeing the last roast lamb for several years. Rehmat Khan said it was impolite to turn down a Baloch’s hospitality and that men so spurned are known to have forsworn their wives if the guest did not relent and accept the proffered hospitality. The word is zan talaq and it is used as a sort of a binding not only upon the one who utters it to do or not do something, but also upon the corrival to acquiesce. That was something like the boys’ rhyme of the Lahore of the 1950s that made all those ‘son of a pig’ if they didn’t take up whatever challenge was thrown. For my part, in order to forestall the hazard of more roast lamb I loudly declared, for all to hear, that I would stand divorced from my wife if Rehmat Khan and his people fed us one more time. This took everyone by surprise. Such a thing was unheard of among the Baloch. One never said zan talaq in order to ward off hospitality. But I had said it and I was standing by it. Nevertheless as we walked down the mountain every time Rehmat Khan mentioned the possibility of more roast lamb at his brother’s home, I reminded him of my avowal. That led to the story of the large-hearted Baloch and his stingy wife who were visited by the man and his naseeb. We arrive in the village of Ugair where Rehmat Khan’s brother nicknamed Akhrote (Walnut, but I never got around to asking why such an impressive person was thus named) was awaiting us. Thankfully there was only tea with biscuits, but the man kept on insisting that he be permitted to take down a lamb. Someone told him I had sworn zan talaq against more hospitality and that finally put the matter to rest. It was already well into the afternoon and if we tarried any longer we would miss the visit to the shrine of Pir Gahno. This was another story related by Rehmat Khan as we were coming down the hill. Some years ago while visiting the tomb of ancestor Gahno; he got into an argument with his cousin who minds the shrine. The burden of the argument lay on the poor quality of food that had been served up to our Rehmat Khan. The argument dragged on with the cousin defending himself as vehemently as Rehmat Khan attacked him until our man pronounced zan talaq: never again was he to avail himself of the hospitality of the side of the family that kept the ancestor’s shrine. Time flew and soon Rehmat Khan was invited to a wedding in that family. He said he could not attend because that would necessarily mean partaking of his cousin’s hospitality and he would automatically stand divorced. This was serious business. Family pressure mounted: as an uncle (and a maternal one at that) of the bride and one of the family’s decision makers Rehmat Khan had to attend the wedding. The ceremony needed his blessing. With the matter of zan talaq niggling at the back of his mind, he attended the party and, naturally, dined with his cousin – an act that automatically affected his divorce. Therefore, to keep matters in legal order a mullah had been imported from Taunsa to officiate over the second solemnising of Rehmat Khan and his wife’s nikah. The needful was done that same evening and by the mullah’s decree the new marriage between the old couple had to be consummated within ten days. With a glint in his blood-shot eyes Rehmat Khan said he had come through colours flying high. There was one setback, however. Rehmat Khan’s wife was no dodo. As soon as the divorce became effective, she demanded her alimony. The man was flummoxed. Five thousand rupees was a good deal of money. But his wife would have it no other way. She had been divorced and she wanted her pound of flesh. Rehmat Khan paid up before he could be re-married. Pir Gahno’s shrine, like Granddad Musa’s, was again an unpretentious cement block cubicle with a single satin-draped burial inside. The obligatory peelu tree with its multitude of coloured cloth bags containing the first shaving of sons born by ancestor Gahno’s agency was right outside shading the cubicle. It suddenly shone on me: two Buzdar ancestors, Musa and Gahno, revered as miracle-working saints. If this wasn’t ancestor worship it was nothing in the world. Why, I wondered, hadn’t any anthropologist ever considered working on ancestor worship among the Baloch? Baloch lore gives them Arab origin – as if that isn’t the case for all Muslims in the subcontinent. Serious research shows however that a very long time ago, much before the advent of Islam, they came from the shores of the Caspian Sea to spread out into the desert regions of eastern Persia and what is now western Pakistan. They descend therefore from an ancient Parthian bloodline. Long centuries ago and far away under the shadow of the Elburz Mountains Baloch religiosity perhaps centered on ancestor worship. The practice appears to have persisted even after conversion to Islam. Where others were encumbered with the invention of Syeds whose tombs could be worshiped for sons and wealth, the Baloch simply continued to venerate their own ancestors. The last item on the itinerary was Khan Mohammed Buzdar. Three years ago while travelling through here with Raheal we had overnighted at the BMP post of Hingloon. They had shown me the slightly bent bars of the jailhouse and told me how one minute Khan Mohammed was locked up inside and the next was outside beside the free men. I had wanted to meet with the man and Raheal dispatched some of his staff to get him. But Khan Mohammed was away in Taunsa and I had to come away without the interview. This time around, Raheal had sent word to Hingloon in advance that Khan Mohammed was to be made available. With ordinary build, gentle face and grey beard he looked like no Samson. He also spoke very softly. It was in 1962 or thereabouts, there had been a gunfight, said Khan Mohammed. He had shot and killed one of the rivals’ number which landed him in the lock up. Outside, his brother Taj Mohammed waited with some men of the other party. Shortly after the last prayer of the evening, he heard a gunshot and the shout that Taj Mohammed had been shot. The BMP men present in the courtyard restrained Khan Mohammed. Quickly he was hand-cuffed and shackled and returned to his cell. Meanwhile, it was also known that Taj Mohammed had only received a flesh wound and was out of danger. The bar-bending superman was once again human. On our first visit one of the witnesses who had seen it all had told me he heard this almighty roar of ‘Ya, Pir Gahno!’ The next thing the man knew Khan Mohammed was standing beside him. Everyone was convinced it was Pir Gahno’s blessing that the man was able to bend half-inch thick iron bars. Khan Mohammed himself believed that as well. When I asked him if he could reenact the long ago feat, he said with great simplicity that he could not have done it then without the saint’s help and he couldn’t do it now. All those who know of Khan Mohammed’s exploit, believe it was Pir Gahno who did it for him. He had called out the saint’s name and the saint came to his aid. I tried to tell them it was the saint, the superman that lived within Khan Mohammed and indeed within all of us as well. But that made no sense to them. It was useless to tell them how karate experts, having discovered through training the superman within, can use his powers at will. And how a shout focuses these powers to a single point to help them achieve the seemingly impossible feat of smashing a pile of kiln-fired bricks. Khan Mohammed’s Pir Gahno had bent thick iron bars for him – but just one time. The Pir Gahno of karate experts does the impossible for them every time they wish. It is only for humans to discover the superman that lives within. My lecture made no sense. Neither to Khan Mohammed nor to the BMP men. Tolerantly they heard me out. We left under a lowering sky. Sheets of lightning flashed on the southern horizon and I dreaded being caught up by a swollen stream. It was all right for Rehmat Khan who promised us more roast lamb if we could stay. Promising to return in case of a flood we finally bade him farewell. Thankfully it rained only lightly that evening. Centuries old Kelash culture is at a greater risk today than any time in the past. Despite their remote location - landlocked in winters - last of the Kelash race is maintaining tenacious hold in district Chitral but is vulnerable to ravages of time and different pressures with external locus. The onslaughts are clearly eating at their open and nonchalant culture. Many have been forced to join the drift to the cities. But when asked what they want, their collective answer was simple: we want our old way of life. Which is why, pastoral Kelash have been able to keep some of their cultural traditions and identity so far.Some historians and anthropologists think that the Kelash are descendants of Indo-Aryans who overran the region in the second millennium BC. The Kelash say they are from a place called Tsiam, though nobody is sure where that is. Commonly they are considered as descendants of Alexander from Macedon who came this way. Their warrior like forebears managed for centuries to keep everyone - including Tamerlane - at bay. In 1893, the British and Afghan governments agreed on a common border that cut right through Kafiristan dividing the community into two parts. Abdur Rahman who was then Amir of Afghanistan renamed Afghan Kafiristan as Nuristan - land of Light. Tradition has it that women are less pure than men are and there are precise rules about what each may do, where they may go and how to purify people and places. Women during menstruation or childbirth are confined to a lodge called Bashaleni (which is also a shrine to the goddess Dezalik, who looks after births). Men cannot go in; even other women must be 'purified' after a visit. In old days, even food could be served to the women confined in Bashaleni only by virgin boys, untouched by women. Gradually these traditions are losing their power. But still it is the women that are seen working around in fields or homes and men spend all their quality time sitting on the pathways. The burden of perpetuating the last strains of Kelash culture is also born by women alone. 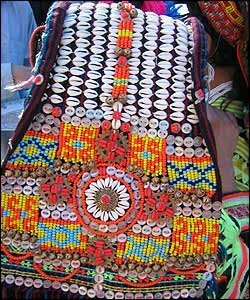 "It is in unique culture that Kelash differ from the rest of the country," confirms Pordum, an elderly resident of village Guru. It is also perhaps the sole claim to fame for the region besides gorgeous natural beauty, poverty and backwardness. Laila Mason says, "unless opportunities are created and due respect is given, this unique culture will disappear fast." This post has turned 180 degrees in its tone in the past 30 minutes of our editing. Read below how. I found the title photo of this post in a web search and was totally mesmerized by it. 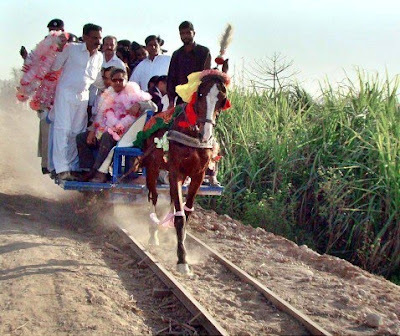 I strarted writing this post with an admittedly ignorant view of the subject and almost made fun of why a horse driven trolley could be a project to inaugurate in today’s modern world - as shown in the title photo. But boy was I wrong! As I started a quick web search on this project, I realized the historical value of this seemingly old and rusty trolley. And now I am very grateful that someone has actually taken the initiative to rehabilitate this part of our history. Chak Number 591-GB is a small village in Faisalabad Division. It is also called Gangapur - named after the famous philanthropist and Indian Civil Engineer Sir Ganga Ram. Some text on the web suggests that Sir Ganga Ram owned the village of Gangapur (confirmation needed). It is said that he was a landlord here and turned it into a model village of the late 19th century. He introduced modern agricultural means and machinery of the time to Gangapur. One such machine was a heavy duty Electrical Motor which was installed in 1898 on Gogira branch canal to pump water for agriculture. This motor was brought to Gangapur from Lahore by railways and this is where the story of our today’s post starts. The nearest Railway Station from Gangapur is another village called Buchiana (101 km from Lahore on Sheikhupura - Shorkot branch line). From Buchiana to Gangapur the distance is approximately 3 kilometers and in 1890s there were no means avialable to transport a heavy electrical motor from Buchiana Railway Station to Gangapur. Therefore Sir Ganga Ram ordered a special railway track to be built for the purpose between the two villages and a horse-driven trolley was used to transport this electric motor to Gangapur. After the motor was installed, the horse driven trolley remained in operation to transport people between the two villages. Therefore the horse driven trolley that we see in the title photo is now 112 years old (built in 1898). It remained in continuous operation for 100 years until 1998 when financial problems and disrepair of track and trolley put an end to the service. That was until yesterday. As our title photo from March 9, 2010 suggests that after 12 years of dis-repair and non-service the horse tram of Gangapur has now been rehabilitated and put back into service. Yes! I’ve also read on the web that both PTV and BBC had made documentaries on this horse tram which attracted many tourists to the area. OK. Now that I’ve given the serious history of the project, how about we go back to my original idea of discussing some lighter details of the title photos here. Note how many pink color haar (garlands) have been put in the neck of the chief guest. As if they were not enough, a guy is holding several more spares in his arms on the same trolley. The single-vehicle entrouge has been provided with its own ample security too. One can see a policeman standing towards the back of the trolley along with several media people. So too was Serai Chhimba built like a fort with massive walls and two gateways, one each in the direction of the rising and setting sun. In the interior, along the perimeter walls, was a series of sunken rooms with domed ceilings and thick walls to keep out the heat and cold. These were the residential rooms for passing travellers while their pack and riding animals were tethered in the broad enceinte. The gatehouses on both sides are massive and have bulky arched openings which, going by their style, are clearly Akbari. While the western gatehouse is now occupied and turned into a residence, the one in the east serves as the only way in and out. Until a few years ago the timber leaves of the gatehouse were still in situ, but with the rise in street level, they became unserviceable and one day disappeared. Local gossip has it that the expensive teak was appropriated and sold by the keeper of the spurious shrine inside the serai. So much for those who pretend to be descendents of a worldly man turned holy post mortem by the accretion of yarns. Fellow of Royal Geographical Society, Salman Rashid is author of eight books including jhelum: City of the Vitasta and The Apricot Road to Yarkand. "It is an island of tranquility only an hour away from home. It surprises me that so few people in Lahore or Kasur know of it. Such a place in India would have been swamped with visitors on weekends," says Salman Rashid. Do you have any idea where? Read the story by Salman Rashid here.